It’ll be a week of cheers and tears as sports fans all over the world are glued to the final stages of two of the greatest sporting events on the planet. 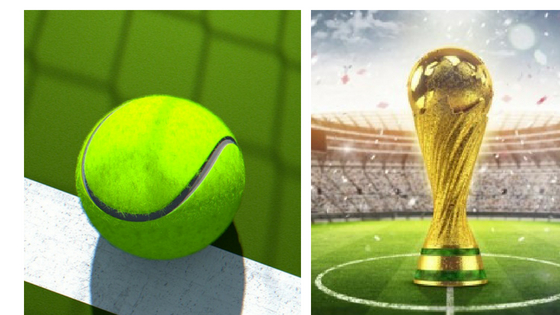 The football World Cup and Wimbledon tennis fortnight always produce heroes and villains in equal measures and for the fans watching, they are both a rollercoaster ride of emotions. England, Croatia, France and Belgium will do battle on the football pitches in Russia this week and each nation has its favourite food and drink which fans will no doubt be tucking into in between cheering their teams on. Of course, England has a wealth of favourites. Who can resist fish and chips? Pie and mash? Or an apple crumble covered in custard? Washed down with local beers which are made all over the country, England can certainly fill you up. Rediscover your love of English food here https://www.bbcgoodfood.com/recipes/collection/british. Belgium is famed for its beer, chocolates and waffles and bot forgetting the delicious fries served with mussels. Click here for other ideas https://www.cntraveler.com/galleries/2014-09-08/10-things-you-should-eat-in-belgium. In France, the wine and cheese will tantalise your taste buds along with famed dishes such as coq au vin and boeuf bourguignon. For more French treats go to https://www.expatica.com/fr/insider-views/Top-10-French-foods-with-recipes_106720.html. Croats tuck into janjetina which is roasted lamb sprinkled with herbs before enjoying mouth-watering desserts including sour cherry pie and plum dumplings. For more inspiration go to https://www.bbcgoodfood.com/howto/guide/top-10-foods-try-croatia. Over on the hallowed courts of SW19, there’s only one food which is king – the strawberry. Wimbledon just isn’t Wimbledon without strawberries and cream, that quintessentially English of all treats. Whether you pour your cream or dump dollops of it whipped on the fruit, it’s the perfect way to celebrate the mother of all tennis tournaments. Drink-wise. you can’t beat Pimm’s which, quite simply, is summer in a glass. As temperatures soar on court, you’ll be glad of a long cool glass of this as you cheer your favourite players on.